With the arrival of the Legacy 1.2 patch comes the much anticipated operation: Explosive Conflict. One of the biggest concerns I had was primarily regarding bugs. At the same time, I had some doubts about the difficulty level of the operation. Would we have a repeat of the Eternity Vault where bugs were so bad that some encounters were unplayable? Let’s take a closer look! The planet of Denova is a welcome change of operation scenery. The Eternity Vault felt rather cold and barren while Karagga’s Palace had a slimy and dirty vibe. 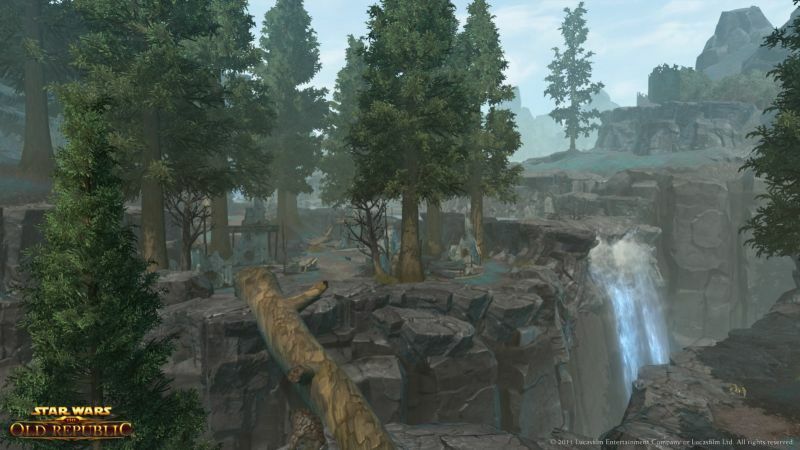 Explosive Conflict is set on a beautifully forested planet with flowing rivers and cascading waterfalls. Among the peaceful scenery, the Empire and the Republic vie for control over the rich baradium deposits this planet has to offer. They have scarred the landscape with battle and mining operations. To complicate matters, a Trandoshian mercenary army has turned against their Republic employers and have taken control. The reason for the double-cross is unknown… until you defeat the final boss. Sorry, no spoilers! Allow me to first alleviate your fears and report that so far the new operation has been mostly bug free! More importantly, I have yet to run across any bugs with the boss encounters. Admittedly, I can only speak of the story mode versions but so far so good. I have to applaud Bioware for their QA testing on the operation. I think that it helped that there were some guilds that had the opportunity to test and provide feedback this time. Let’s face it, game developers can sometimes forget how ‘creative’ MMO players can be when facing boss encounters. The first two boss encounters (Toth and Zorn and Stormcaller and Firebrand) are exquisitely complex with a lot of mechanics to watch out for. You will spend a long time learning the fights until the coordination is there. I would recommend having full Rakata gear before you decide to take a look. Even in Story Mode these fights are not what you would call easy. With practice, they do get easier but they still offer a challenge. The puzzle boss of this operation is Colonel Vorgath and he is the third encounter. While the fight is fun it doesn’t really pose much of a challenge in Story Mode. 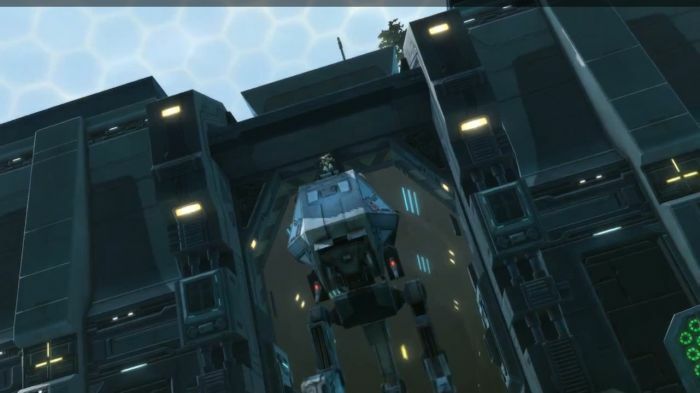 Of the puzzle bosses of SWTOR, I would rate the difficulty right between the Ancient Pylons and Heavy Fabricator. We pretty much 2 shot this boss on our first meeting with him. The final boss, Warlord Kephess, had great potential to be very challenging. His encounter had a lot of mechanics to it but they weren’t all that hard to deal with. I understand that this is Story Mode but I felt that it should at least be on par with the first two bosses. I have to say that I am disappointed that there were only four boss encounters in this operation. I would have liked at least the same amount the others had. Also, the trash pulls were more annoying than challenging. It seems they were just placed there to get in your way more than anything. Trash mobs leading up to a boss usually give hints as to the mechanics you will encounter in a boss fight. In this operation, however, they just slowed you down and served no purpose other than to take up time. Perhaps they have a chance to drop a rare schematic but so far I’ve yet to see anything of the sort. At least have them drop more credits. I will say that I am thankful for Bioware for reducing the cost of repairs! Overall, I would have to grade the Story Mode operation a solid B. The encounters are bug free (so far) and mostly challenging, however, there is definitely room for improvement in terms of flow. The story behind the operation is great as well and I am looking forward to trying out the Hard Mode version. I would like to hear some feedback from some of you out there who have had the opportunity to check out the operation. Please leave a comment and let me know what you think! Good article, Ghozzt. Can’t wait to try this out. The tanks, Firebrand and Stormcaller, in 16-man hard mode is currently the hardest fight in the game. The required choreography is very difficult to pull off. The shields spawn in 6 different space and they’re random, and everyone has to run to the right shield. If one shield doesn’t have enough people they probably wont kill the adds that spawn. If another shield has too man people the shield will break early and everyone that was protected by the shield previously will die killing 5 people, and the Enrage timer is exceptionally tight. I’ve killed it, but we’re talking pulling the same fight for 8 hours before everything finally clicks and you kill it.